Numerous herbs may be helpful in stopping your sugar cravings. According to MayoClinic.com, people should control or eliminate sugar cravings, as out of control blood sugar levels can lead to many significant health problems, including heart, kidney, eye and nerve damage. Before taking herbs to help stop your sugar cravings, talk with your doctor about possible side effects, proper dosage and potential drug interactions. Gymnema is an herb that may be helpful in stopping sugar cravings. According to the University of Michigan Health System, gymnema, also known as Gymnema sylvestre, is a woody climbing plant native to the tropical forests of central and southern India. The leaves of the plant are used medicinally. When chewed, the leaves interfere with your ability to taste sweetness. The Hindi word for gymnema is gurmar, which means destroyer of sugar. Dr. Sharol Tilgner, a naturopathic physician and author of the book "Herbal Medicine From the Heart of the Earth," states that gymnema is a hypoglycemic, hypolipidemic and anti-atherosclerotic. Gymnema, notes Tilgner, is believed to work directly on your pancreas to help control blood sugar levels and stop your sugar cravings. Before taking gymnema to help stop your sugar cravings, talk with your doctor about possible side effects, proper dosage and potential drug interactions. Stevia is an herb that may be beneficial in stopping sugar cravings. The Memorial Sloan-Kettering Cancer Center states that stevia, also known as Stevia rebaudiana, is a plant native to Brazil, Bolivia and Paraguay. The raw leaves and purified extracts of the plant have been used as sweeteners and touted as sugar substitutes for diabetics. Along with stopping your sugar cravings, stevia has been used to treat hypertension, inflammation and obesity. Although stevia extract is said to be 200 to 300 times sweeter than table sugar, it has a negligible effect on your blood glucose levels, and it may even enhance your glucose tolerance. Using stevia as a natural sweetener may help you avoid using table sugar, which may help stop your sugar cravings. Before using stevia to help stop your sugar cravings, talk with your doctor about possible side effects, proper dosage and potential drug interactions. Fenugreek is an herb that may be effective in stopping sugar cravings. According to the National Center for Complementary and Alternative Medicine, fenugreek, also known as Trigonella foenum-graecum, is used as both a food and a medicine. Fenugreek, a member of the legume family, has a bitter, maple-like taste. The seeds of the plant are used medicinally to treat numerous health problems, including elevated blood glucose levels in people with diabetes. Tilgner states that fenugreek is a hypoglycemic, or a substance that lowers or regulates your blood sugar levels, which may help control your sugar cravings. 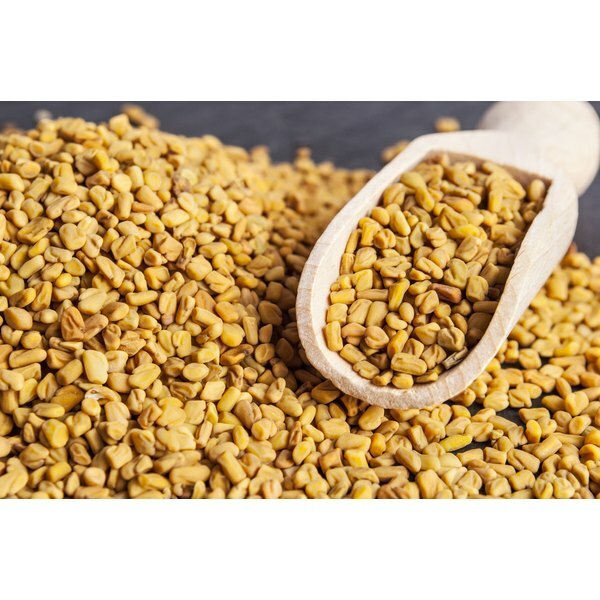 When fenugreek is taken by mouth, you may experience gas, bloating and diarrhea. When fenugreek is applied to your skin, you may experience skin irritation. Before taking fenugreek to help stop your sugar cravings, talk with your doctor about possible side effects, proper dosage and potential drug interactions.